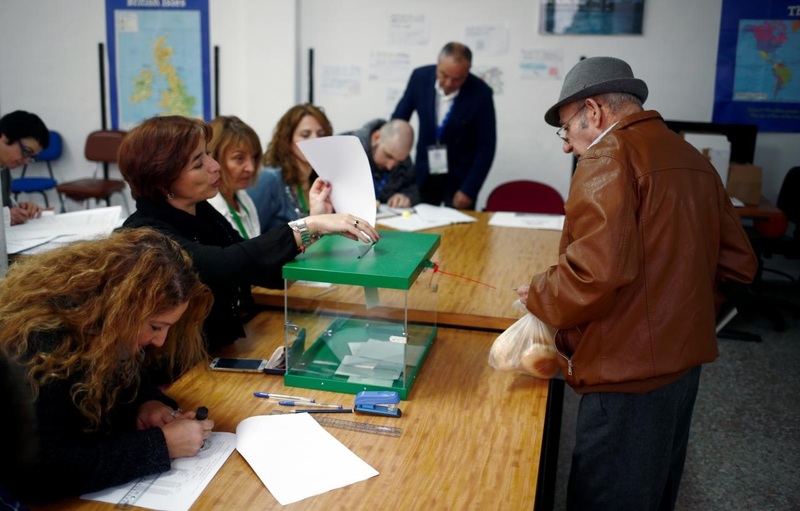 SEVILLE, Spain -- Polls opened in Spain’s Andalusia region on Sunday in a first electoral test for Prime Minister Pedro Sanchez, whose minority government has struggled to pass a budget since taking office last summer. The election in Spain’s most populous region, a stronghold for Sanchez’s ruling Socialists for decades, is taking place amid a fragmented political landscape in which major parties struggle to secure majorities. Voting began at 9:00 on Sunday in what polls suggest will be a fiercely contested race in which no single party is predicted to win a majority. Polls predict the far right could win its first seats since the 1970s, bringing a nationalist surge that has swept other European countries to Spain, long seen as immune because of the recent memory of military dictatorship that ended only in 1975. The campaign in Andalusia has focused in large part on national issues such as the Catalan secession crisis, budget deadlock and immigration. Anger at Catalan separatism, and Sanchez’s more conciliatory approach to pro-independence parties whose votes helped bring him to power, has been a focus of several parties’ campaigns. “We are as Spanish as we are Andalusian, and that’s why it pains us to see what is happening in Catalonia,” Juan Marin, candidate for center-right Ciudadanos, told a crowd at a campaign rally in Seville on Friday. The issue of immigration has helped drive the rise of the far-right party Vox, which is predicted to win up to five seats, according to a poll of polls by newspaper El País, though it could still win none. “The homeland must come before political parties which have become end in and of themselves,” Vox leader Santiago Abascal told a crowd in Almeria on Friday evening, the last day of campaigning before the vote. Andalusia, which has some of the highest unemployment rates in Europe, is the main arrival point in Spain for migrants crossing the Mediterranean. The number reaching Spain has grown in the past year even as traffic on the main sea route to Europe from Libya to Italy has slowed. Opinion polls show the Socialists winning the most seats but falling short of a majority. The regional election was called early after a pact between the Socialists and center-right Ciudadanos collapsed earlier this year, and forming another coalition to run the region could prove similarly fraught. Political parties in Spain have struggled to win majorities or build workable pacts in recent years as establishment parties have lost ground to Ciudadanos and anti-austerity group Podemos. The expected lack of a majority mirrors similar expected results in municipal, regional and EU elections in 2019, and a general election which must be held by the following year.